The Olympic Games are unique amongst mega sporting events, not just because of the scale of infrastructure investment and impact on host cities, not even because of the scope of media attention, which provides an unparalleled platform for the promotion of carnival capitalism under the banner of national and civic ambition ; rather the Games are invested with a peculiar prospect of hope for a world in which the idealism of youth as captured by sport prevails over geo-political conflict and a prolonged retrospect in which their legacy – the material and social benefits supposedly accruing to their host communities- is subject to a combination of intensive short term monitoring and long term collective amnesia. How is it possible to create a ‘Post Olympics’, which is neither a simple material trace of a historical event (the 2012 Games), a sentimental retrieve of a liminal moment of national triumphalism (as celebrated in the Ceremonies and Team UK’s crock of golds), nor a re-iteration of an original compact with the host city struck in the heat of the bid, but which has long since lost any rhetorical purchase it once had on its citizens? It is a characteristic of any Post Olympic city that it remains haunted by extravagant promises of regeneration, and by the disappointment that inevitably comes with the discovery that it is indeed impossible to live the dream. The form of this haunting is unique to each Olympiad, and bears on the specifics of the deal struck with local communities and their political representatives. In the case of 2012 the legacy promise to the people of East London has come to be known as the ‘convergence agenda’ : the life chances of working class children growing up in Newham and other host boroughs was to be the same as their middle class peers in more traditionally affluent parts of town. Or as Boris Johnson, put it in his inimitable style, the natural tendency of kids in East London to riot will be curbed by the fact that they will derive as much benefit from hard rugby practice as their peers attending private schools in Richmond. Lol. London Olympic Lies. The idea that in a society where structural inequalities are intensifying, partly as a direct result of government policies, the Olympic legacy could create a bubble of prosperity in which this trend is locally reversed is pure magical thinking, but it takes our leading Brexiteer to give it a properly farcical twist as an old Etonian injunction to the lower orders to ‘play up, play up and play the Game’. In the context of the EU referendum debate, we have indeed seen the London 2012 dream re-stated by the Leave campaign in an exercise of smug self congratulation, arguing that 2012 proved that Britain could put on a successful show as a stand alone nation, open to the world, and united in the spirit of enterprise that had once upon a time ( i.e. before our accession to the EU) made us great. Post-Imperial nostalgia, only evoked ironically and in passing during the actual 2012 ceremonies, thus made a come back bid in a retrospective claim that the Games prefigured a collective desire to re-invent the island story. But what if the economic outcome of Britain’s leaving the EU were to finally dash the hopes of those who believed that the legacy of the Games would bring about an economic transformation of East London for the immediate benefit of its existing communities? In more general terms it seems to me that the Olympics offer us the tragic-comic spectacle of a huge human enterprise which destroys itself as it becomes mired in sordid political machinations and bureaucratic mechanisms of public unaccountability, not to mention doping scandals. It is a dream machine that all too readily becomes a nightmare for those populations in whose name, and for whose benefit the whole exercise is conducted. Increasingly the citizens of potential host cities are saying no to bidding – the Games are not worth the candle they light for carnival capitalism. Is this what it means to live the Olympic Dream, to remain permanently poised between a utopian project, demanding the impossible and the repression of hopes and desires for a better world that it evokes. The situation is acerbated by a disjuncture between pre and post Olympic time, the first flooded with high anxiety and anticipation, the second by an interminable fading of horizons of possibility – will the 2012 Games be finally over in 2020, or 2050, or whenever some legacy body decides to call a halt to the evaluation of its ‘catalytic effects’? If Olympic Cities are imagined looking forwards to a more or less Utopian future in which the hopeful vision of the bid will have materialized on the ground, they are remembered looking back in regret at what was a once-upon-a-time ideal. This split temporality also has its spatial correlate in the corporate imagineering that conjures up an area of urban dereliction in desperate need of large-scale regeneration in order to project onto it a futuristic scenario of magical transformation. If Post Olympic Urban Studies is to develop a properly comparative frame, then it surely has to has to be able to move more fluently between the Olympics bid as civic compact, Games Time as Sporting Spectacle, and Legacy as networked material and social infrastructure, considering each instance from both local and global, synchronic and diachronic points of view. Does this mean that there is never any end to the story? On the contrary, it allows us to arrive at a principle of narrative closure. Whenever it becomes clear that no further iterations are possible, that the terms and conditions of the Compact are fixed, that the Spectacle is not subject to re-visioning and the Legacy, in whatever form, cannot be reconstructed, then we can draw a line under the event and move on. In the case of London 2012, that point has not yet been reached. This is not because there are milestones still ahead in the planned development of the Olympic Park and its environs, but because the sociological imagination of London as a Post Olympic City is not yet exhausted, even if has been largely hi-jacked by corporate ‘imagineers’. 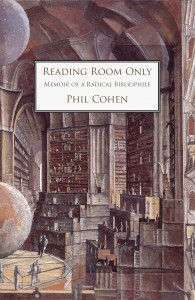 How to reclaim and renew the imagination of a better world, a juster city and embed it where it matters most, in the everyday lives of citizens, at a time when the principles of hope which animate such a project are being undermined on every side, that is the challenge, at once political, conceptual and heuristic that we face. In fact these terms gloss an extremely complicated set of negotiations between public bodies charged with delivering specific objectives, private interests that have a financial stake in the outcomes, the political representatives of the communities that are interpellated as beneficiaries, and the disparate groups that form in opposition or support to the Games. Each host city convenes a unique configuration of these elements, which come together around the contested promise and process of regeneration whose bargaining power can change considerably over time. The great weakness of ‘mega-event’ analysis is that it is purely conjunctural; it lacks a sense of historical transition, which is largely due to its overwhelmingly functionalist model of causal explanation. The ‘Post Olympic’ is about the transition of the legacy narrative from the realm of the social imaginary to a putative – and contested – social fact. 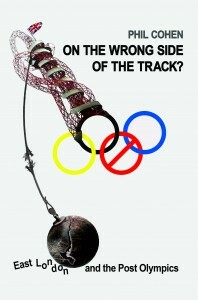 It is also about how the narrative legacy of a Games becomes embedded in an official memoryscape, through the intervention of the Olympic heritage and research industries, to establish its reputational position and identity in a league table of past successes and failures, which is itself subject to perpetual revision. To grasp what is truly at stake here I think we need a more sophisticated theory of legacy transitions, so that its different moments can be grasped not just as freeze frames but as part of an unfolding dialectic,but not repeat not as a teleologica, process. Transition can be a matter of transference – the transference of assets and functions from one regime of envisagement to another and also a carry-over of structures of feeling (hope or pessimism) associated with them. It can be more a question of translation, in which something is both lost and gained through the shift in discursive idiom or material mis- en- scene. Or perhaps it is more a case of trans-valuation which fundamentally reconfigures the meaning and weight of some elements of the Olympic compact, whilst conserving its underlying structure. Or finally is it a matter of simple erasure – the bulldozing of one set of principles and priorities and their replacement by another. These different modes of transition have very different implications for how legacy and the Post Olympic are defined, delivered and evaluated and thus shape the consequences for different stake holders. For example if legacy is defined in term of a moral economy of worth, that is as the transmission of a gift, with or without strings, then the question become how far in the transition to the Post Olympic is that bequest honoured or traduced, for example by being translated from the idiom of a moral economy into the very different priorities of a market economy, as a dividend or payback for a prior investment. In contrast if the legacy is measured in purely economistic terms, then cost/benefit analysis becomes the sole arbiter of value, and the notion of endowment which is central to the moral economy of worth is marginalised. On the other hand, if legacy is given an added symbolic value as an heirloom, something to be held in trust for future generations, then civic bodies representing host communities have a much larger stake and say in the outcome and the dominant discoursive idiom become less one of financial accountancy, moral judgement or legal adjudication, but public or governmental accountability. Secondly, if public debate about the value or otherwise of the Olympics to host cities is not just to be driven by short term political and media agendas, then it will have to break with the principles of periodicity that the Games time frame currently imposes and instead use the Olympics to raise wider issues about the direction of travel in which the host society – and host city – are going. 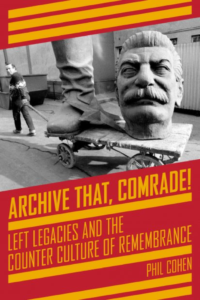 For this purpose, it is time to move on from mega –event analysis and towards the comparative analysis of micro-histories – and geographies – of transition. Legacy should no longer regarded mechanistically as a ‘catalytic effect’, but as a re-negotiation of the original Olympic Compact, constituting a discrete site and moment of contestation between the rival claims of host communities and corporate business interests, variously mediated by civic authorities. Secondly if the story of each Olympiad is pre-eminently that of its host city, then we can only understand its meaning to its citizens if we place their experiences of its costs and benefits at the centre of the account and interpret this locally situated information within a deeper analysis of the urban regeneration process as it unfolds over the long duree. London 2012 makes no sense unless it is placed in the context of the social transformation of East London since the closure of the Docks in the 1960’s as this has been lived by successive generations of East Londoners. The aim is to explore a range of issues to do with class, race or gender, that people are often reluctant to talk about, getting them to represent structures of common feeling linked to place identity and belonging via various kinds of story telling, art work and mapping and within a framework in which they can begin to own rather than disown the often taboo or repressed aspect of these sentiments associated with the negative impact of structural change on their life stories, life styles and livelihoods. In the first part of On the wrong side of the track ? I present the results of this work in different parts of East London between 1971 and 2001. In the second part of the book, there is a chapter called ‘Speaking out of Place’ which is based on field work I did with a range of groups in Newham between 2007 and 2012 as they variously responded to the vicissitudes of the 2012 delivery. By no coincidence this is also the title of a post 2012 project LivingMaps have just completed in and around East Village and the Olympic Park [i]. So to end on an appropriately metaphorical note, I want to argue for the importance of setting the pace for the particular long distance event that is the Post Olympics ( a role which I believe in the trade is known as ‘running the rabbit’ and is usually reserved for older athletes who are likely to run out of puff ) by inserting it in a more precise theory of legacy transition. At which point I am happy to hand over to Debbie Humphry for the really interesting part, cutting to the chase of what sense people who moved into the ex- athletes village made of the legacy narrative and the narrative legacy of 2012 , and how they did or didn’t live the dream at this particular moment of its (de)materialisation. [i] For a full account of this multimedia project see the report published on the Living Maps website :www.livingmaps.org.uk. The project video made with young people living in East Village is available on You Tube https://youtu.be/TfdUuj09BqE. A Young Person’s Guide and Map to the Olympic Park is available at www.OurEast20.london. 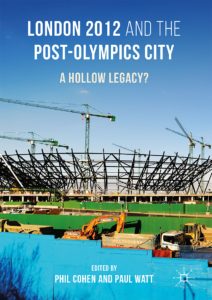 The ethnographic fieldwork is reported in two chapters in London 2012 and the Post Olympic Legacy :A Hollow Legacy? 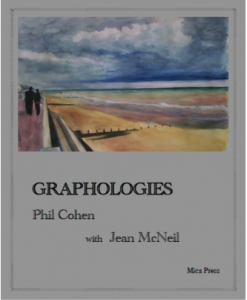 Edited by Phil Cohen and Paul Watt to be published shortly by Palgrave Macmillan.